The end of the NASCAR Whelen Modified Tour season might not have been great for Donny Lia, but he’s always been a big fan of the North-South Shootout at Concord Motorsport Park. “I’m relieved because it was ours to lose,” said Lia after the race. “We were the fastest car all day yesterday and today. That is hard for me, because now all day long, I’m thinking how I could mess it up. I knew I had a car that could win the pole. 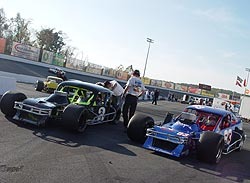 Because only the top-five drivers were locked into the field, the rest of the competitors had to try and make it in through one of four heat races. Lia didn’t have to worry about that. Zach Sylvester had never seen Concord Motorsport Park until Thursday afternoon. Concord is not easy track. And Zach would have told anyone how much he hated it after Thursday’s practice sessions. However, Friday night, he was singing a different tune after qualifying second. “That’s a lot of pressure off of my shoulders. For the first time every being here and the first time ever seeing the place, we’re pretty happy. We were junk yesterday. We changed a bunch of stuff on the car, did a little bit of homework last night and came back today and it was totally different. Sylvester loves the half-mile tri-oval. Chuck Hossfeld was the first driver not to get locked into the field after qualifying sixth on Friday. So he just showed that it didn’t matter at all, dominating the first 20-lap heat race, locking himself into the event. Hossfeld got a jump on Southern driver Tim Brown and led all 20 laps. Brown was able to hold onto second, with the #15 of Tim Arre coming home third, locking himself into the show. It was too bad that fourth-position wasn’t the transfer spot, as JR Burtuccio and Andy Seuss put on a hell of a show, finishing side-by-side at the checkers. Suess was awarded with the position. “That was fun,” said Seuss. “It was just too bad that it wasn’t for the transfer spot. But we have ourselves a pretty good starting spot for the consi tomorrow. The car wasn’t too good early, but it got a lot bette by the end of the night. There were 44 cars that competed in qualifying for the North-South Shootout on Friday night. 40 of those cars took qualifying attempts. Donny Lia was fastest at 15.605. Wayne Anderson was slowest at 17.123. There were 16 Southern Division representatives, with the rest coming from the North. Some notable names missing from the Southern Division roster included Michael Clifton, Jay Foley and Bobby Hutchins. A few different Southern names include Darrel Krentz, Johnny Sutton, Joshua Nichols, Aubrey Fishel and Brandon Hire. 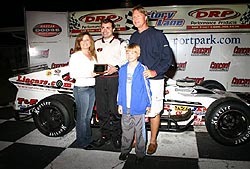 Several Northern representatives are missing, most notably Whelen Modified Tour Champion Tony Hirschman. Other big name Northerners missing include Jerry Marquis, Rick Fuller and Eddie Flemke Jr.
A total of 41 drivers attempted to qualify for the SK Mod race. 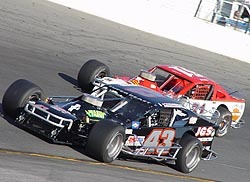 There are several drivers, including both Blewett brothers and Ted Christopher, that are puling double duty this weekend, running both the Modified and SK shows. Southern Division driver Tim Brown is also pulling double duty, but his second race with be behind the wheel of one of the vintage modifieds. Doug Coby continued the trend of dominating heat races, leading all 20 laps from start to finish to win the second heat on Friday night. It took a couple of starts for Coby to get the win, after officials said he jumped the start. Once the green was out for good, Coby was able to pull away from the Southern duo of Jay Hedgecock and Brian Loftin, who each locked themselves into the field as well. 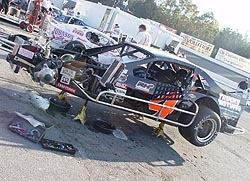 The real story of the heat might have been Johnny Sutton, who wrecked his brand new car in practice, pulled out a backup and started in the rear of the field. 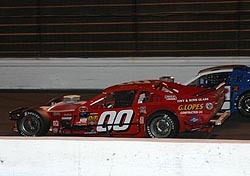 After just four laps of practice before the start of the heats, Sutton moved his way through the field finished sixth. 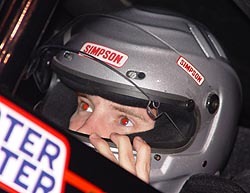 Last year, Matt Hirschman made it only a couple of laps in the North-South Shootout, getting caught up in an early accident and knocked out of the event. This year, Matt would like to make a few more laps, and he’ll have a good shot after qualifying third. It wasn’t an uneventful day for Hirschman though. He spun in the second round of practice on Friday afternoon. “I don’t think we have as good of race car as the cars we timed with. We’ll see. In practice, we were not as fast. When I did try and find a little extra to get closer to their times, I ended up spinning the car out. I know the limit of the car. I know where I can’t push it past. Johnny Sutton had a big time accident on Friday afternoon at Concord. 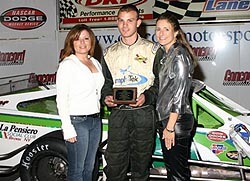 Bobby Santos III ran a lap that would have qualified him 17th for the North-South Shootout on Saturday night. 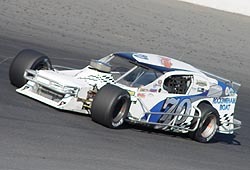 However, his 16.012 was fast enough to grab the pole for the SK Modified race on Saturday night. 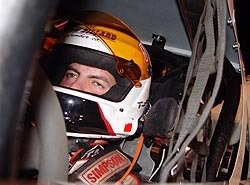 Jimmy Blewett, one of the numerous drivers doing double duty, qualified with the second quickest time. Ronnie Silk was the third quick qualifier, followed by Justin Gumley and Woody Pitkat rounding out the top five. Eric Beers didn’t want to be outdone and he wasn’t on Friday night. After the previous two heat race winners lead all 20 laps en route to the wins, Beers did the same, winning heat number three. “It was good,” said Beers. “It gave us some time at night and a 20 laps run to see what it would do to the tires. it pretty much showed us all we had to do is tighten it up. we were pretty good. The real story might have been two top contenders falling out of the event. Mike Christopher never seemed to get up to speed after motor problems surfaced in the opening laps. He pulled out of the race a few laps later. Kirk Alexander slowed and also pulled off the track just a few laps later. However, Alexander has a guaranteed starting spot. Pete Brittain and John Smith each locked themselves into Saturday’s field by finishing second and third. Burt and Jason Myers’ mother said that they were trying to give her a heart attack on Friday. If they were trying, they did a good job at it. Things started bad early for the brothers, when Jason unloaded and went out on the track, only to blow an engine a few laps later. That meant a long “road trip” to get the spare for the younger of the brothers. “We unloaded off the track and we were running 80s with the car on tires that we ran at Ace last week, so I knew we were in the ballpark. I heard it starting to make a racket in practice, so I pulled it in and shut it off. “I had to make a trip back to Winston-Salem to get the other motor. I got back here at 6pm with that other motor and got it put in. We made the heat race. We have a guaranteed spot in the show. That is really the only reason we did what we did, or we probably would have just let it go. While Myers was driving, his phone rang. Those at the track informed him that his brother, Burt, was just involved in an accident during the final round of practice. “They hadn’t thrown the caution when I crossed the start/finish line and I ran down into turn one and there were a couple of cars all sideways and I ran right into them,” said Burt, who hit the stopped car of Johnny Sutton. MOD HEAT FOUR: TC DOES IT AGAIN. Ted Christopher made it four-for-four in Northern heat race winners, and four-for-four of heat races with no lead changes. TC jumped to the lead, but Jamie Tomaino down into turn one and never looked back. 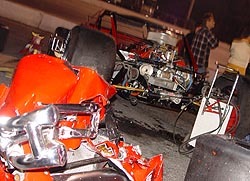 Tomaino eventually lost second to John Blewett III, but both drivers were able to lock themselves into the show. The excitement of heat four actually came before the green flag flew. Nevin George’s #00 caught fire before the green flew. He stopped and got the fire put out and restarted the event, only to pull off a couple of laps later.